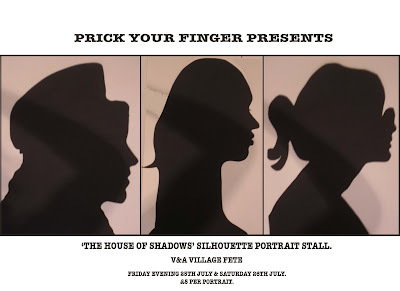 Prick Your Finger would like to invite you all to our "House of Shadows", a silhouette portrait stall, where you can have your profile cut for a mere £5. and day of Saturday 26th July. Our friends, Tatty Devine, Mark Pawson, and Rob Ryan, will all be there. Come along!